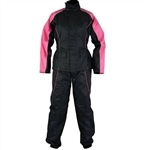 Don't let a little rain ruin your ride, be prepared with a motorcycle rain gear 2 piece suit made just for women. Store a rain gear outfit in your bike in-case you run into unfortunate weather situations. Our women's rain gear is made to fit the female body and includes heat panels so its safe to wear on the bike. Be sure to check out our selection of mens motorcycle rain gear or browse our full line of ladies motorcycle apparel.